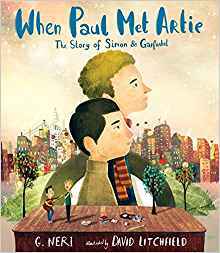 Long before they became one of the most beloved and successful duos of all time, Paul Simon and Art Garfunkel were just two kids growing up in Queens, New York — best friends who met in a sixth-grade production of Alice in Wonderland and bonded over girls, baseball, and rock ’n’ roll. As teens, they practiced singing into a tape recorder, building harmonies that blended their now-famous voices until they sounded just right. They wrote songs together, pursued big-time music producers, and dreamed of becoming stars, never imagining how far their music would take them. Against a backdrop of street-corner doo-wop gangs, the electrifying beginnings of rock ’n’ roll, and the rise of the counterculture folk music scene, G. Neri and David Litchfield chronicle the path that led two young boys from Queens to teenage stardom and back to obscurity, before finding their own true voices and captivating the world with their talent. Back matter includes an afterword, a discography, a bibliography, and a fascinating list of song influences. This book is a colorful and vibrant way to introduce a new generation to two legends from the music world. Paul Simon recently announced his farewell tour and you can read his goodbye letter here. About the Author: G. Neri is the award-winning author of many books for young readers, including Ghetto Cowboy, winner of a Horace Mann Upstanders Book Award, and Hello, I’m Johnny Cash, an Association for Library Services to Children Notable Book. He lives in Florida. About the Illustrator: David Litchfield is the creator of the award-winning The Bear and the Piano and the illustrator of several other books for young readers. He lives in the United Kingdom. ← Kiddyzuzaa Land: Episode 1 🏰 Princess Sleepover GOES WRONG!